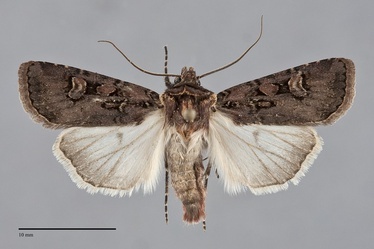 Euxoa declarata is a small to medium-sized Euxoa (FW length 14–18 mm) with a dark purplish gray forewing with black lines, spots, and cell, a pale yellowish lining the reniform spot, and whitish hindwings with a dark marginal band that flies in a variety of habitats east of the Cascade summit during summer and early fall. The forewing is nearly uniform very dark brown-gray with a purple tint, occasionally pale gray in specimens from desert environments. The costa in the subterminal area and the terminal area are slightly darker gray. Some pale gray specimens have a dark gray or slightly reddish flush distal to the reniform spot. The cell is black. The basal and antemedial lines are black, double with filling of the ground color or a barely lighter shade. The basal line is irregular, interrupted at the cell. The antemedial line is weakly zigzagged, nearly perpendicular to the posterior margin. The median line is dark gray, very faint. The postmedial line is single or double, weakly scalloped, drawn toward the base on the costa, weakly excurved near the reniform spot, and angled basad below the reniform spot. The subterminal line is very weak, absent except as the medial border of the gray terminal area or comprised of powdery pale yellow spots, slightly uneven, preceded by a dark shade on the costa and sometimes by a weak shade across the rest of the wing. The terminal line is black, thin or a series of spots between the veins. The fringe is concolorous with the terminal area. The orbicular and reniform spots are partially outlined by black, lined by thin light yellow, and filled with the ground color. The orbicular spot is usually oval, less often round, often open toward the costa or both anteriorly and posteriorly. The reniform spot is kidney-shaped, also often open at one or both ends. The claviform spot is black, moderate-sized. 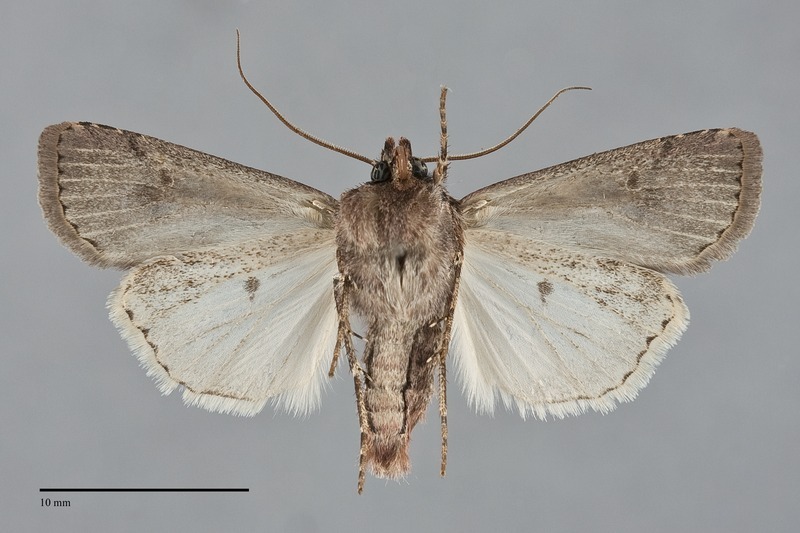 The hindwing is somewhat variable but usually nearly white in Pacific Northwest specimens, darker gray at the margin, with thin discal spot, veins, and terminal line, The hindwing fringe is white with an ochre and gray base. The head and thorax are the same color as the forewing, with a thin black transverse line across the mid-collar. A frontal tubercle is present. The male antenna is strongly biserrate. Euxoa declarata is a member of the declarata species-group of the subgenus Euxoa. This species can be identified as a member of its species-group by the smooth dark purplish brown-gray forewing with a black cell and spots lined by black and inner yellow lines. It is difficult to distinguish E. declarata from Euxoa rockburnei. The hindwings of E. declarata are usually white in the Northwest, although the shade varies across the range of the species and by habitat type, while those of E. rockburnei are light gray in males and darker gray in females. This species is slightly redder and browner than E. declarata, most evident when series are compared side-by-side. Euxoa campestris, the other species in the species-group, is restricted to British Columbia and the eastern part of the Northwest. It is more similar to E. rockburnei than E. declarata, and is smaller, darker, and redder than E. declarata. The structural differences of these species are described by Lafontaine (1987). Males of E. declarata can be told from those of E. rockburnei by the relative size of the sacculus relative to distal valve and by the relative orientations of the harpe and saccular extensions. The saccullus is smaller than the cucullus and the angle formed by the harpe and saccular extensions form an angle less than 90°. In E. rockburnei, the sacculus is larger and the angle is greater than 90° In females, the hard plate in the ventral ductus bursae is has smooth margins and is bilaterally symmetrical in E. declarata, rough along the margin and bulging toward the left in E. rockburnei. Euxoa declarata can also be confused with Euxoa albipennis, especially females which have a dark gray forewing. The orbicular spot of E. albipennis is smaller and more strongly oval than that of E. declarata, and its hindwing is darker gray with dark veins. The type locality of Mamestra declarata Walker is Vancouver Island, British Columbia. This species is widely distributed in coniferous forests throughout much of North America, but also occurs in prairie and desert habitats. In the Pacific Northwest, it occurs in a variety of habitats but is most common in relatively open forest and sage steppe near water. It is common in spruce-fir forests along the summit of the Cascades, and in ponderosa pine forests and juniper woodlands at middle elevations east of the Cascades. West of the Cascades, it also occurs in coastal rainforests and mixed hardwood-conifer forests at low elevations, but is usually uncommon to rare in this part of its range. It is also rare on dry, open sagebrush steppe, but is frequent in moist sagebrush steppe adjacent to wetlands such as marshes and riparian zones. Euxoa declarata is found east of the Cascade and British Columbia Coast Range as far north as south-central British Columbia. It is widespread in eastern Washington, Oregon, and Idaho. It is found less commonly west of these mountains, predominantly near the Gulf of Georgia in British Columbia and Washington and south of west-central Oregon. This species has a wide distribution in North America, occurring from central Alaska to the Canadian Atlantic Provinces. The range extends south to the southern parts of Ontario and Minnesota in the East, with a disjunct population in North Carolina. It is more widely distributed in the west where it is occurs from the western Great Plains to the Pacific. It reaches its southern limits in New Mexico, Arizona, and southern California. The adults fly in summer and fall. They have been collected from early July through September in our region. They are nocturnal and come to lights.